'...now, what about the danger bend? 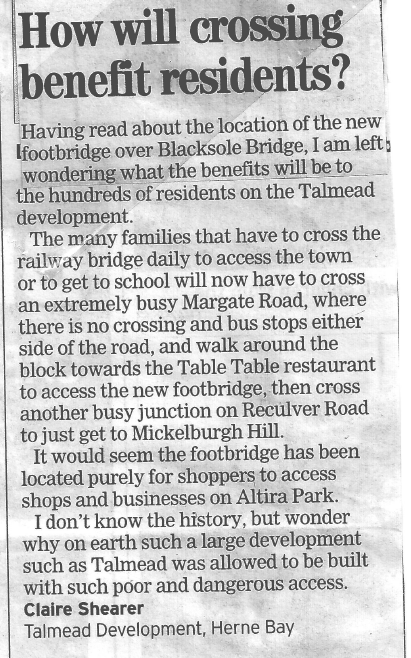 Genuinely good news - the installation of a segregated cycling and pedestrian bridge over the railway line in Beltinge, linking Reculver Road and Mill Road South. Many of us were there on Sunday to witness with bated breath the engineering feat of the pre-fabricated bridge being lowered onto its moorings on either side of the line. However, Spokes East Kent Cycle Campaign Group, which speaks for all vulnerable road users, would like to stress that this is only the beginning of a safe provision for pedestrians and cyclists wishing to pass from Beltinge to Broomfield. 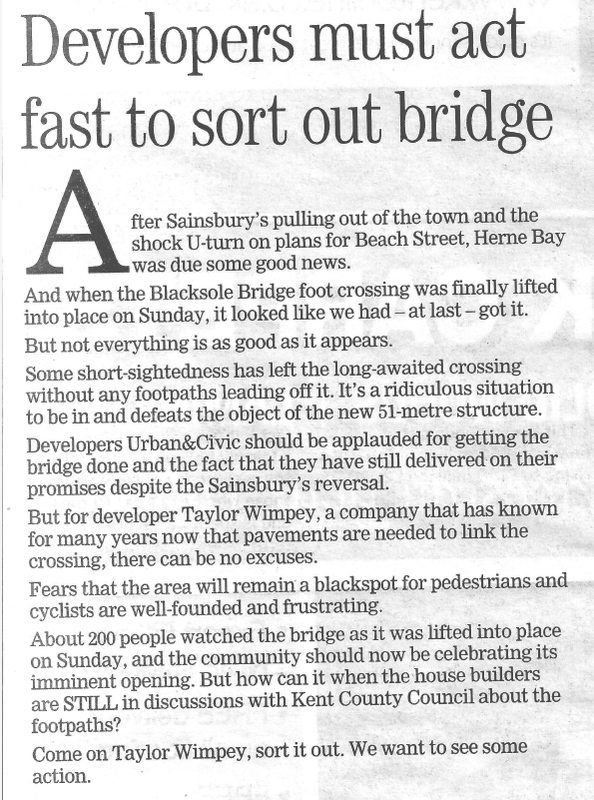 Ideally, the new bridge should have been on the other side of the road, although realistically one can see that putting it across the line on the western side (the Herne Bay side) is impossible owing to the presence of lived-in private properties on both sides. However, the necessary siting of the new bridge means that anyone using it to cross the railway line from Beltinge to Broomfield emerges back on to Margate Road/Mill Lane (on the south side) at the worst possible place on the sharp bend in Margate Road. This is the point at which most pedestrians will want to cross the road, and most cyclists will want to turn right, everyone heading for the Thanet Way underpass. The sight line to the right is OK, but there is zero view to the left and careless drivers can frequently be seen coming too fast from that direction. Indeed, just today, I saw a vehicle have to do an emergency stop as it sped round the corner to avoid hitting an elderly gent who was crossing the road at the very spot where the bridge-user will emerge onto the highway. Walking left towards the two restaurants around the corner, where crossing the road is much less risky, is not an option as there is no footway and nowhere to take refuge between the highway and the hedge. Furthermore, on this bit of the bend there is no street lighting! So, well done for the new bridge, but let us be quite clear that it merely moves the road safety problems of this little area further along the road. Dr Gillian Corble, vice-chairperson, Spokes East Kent. Those of us who live, walk or cycle in the Beltinge/Broomfield area, which straddles the New Thanet Way in the Mickleburgh Hill/Mill Lane/Margate Road neighbourhood, will know of the notorious Blacksole road bridge which takes Reculver Road/Mill Lane across the railway line in a North/South direction. The bridge as it stands is narrow, will barely allow the passage of two cars and not that of a bus and car, has a low parapet and no footway. With traffic in both directions there is no room for walker/cyclist, and no safe haven. The 4/6 bus route has around four buses an hour using this bridge. This is the main way to get into Beltinge and east Herne Bay off the Thanet Way and is moderately busy vehicularly. Vehicle drivers coming off the Thanet Way have been travelling only minutes earlier at 70mph and there is a risk of them being velocitised, i.e., still travelling too fast. Travelling in a southerly direction, there continues to be no footway, not even a grass verge of any note; there is just one pale street light; the road is bordered by high-growing vegetation; there is no attenuation of the 30mph speed limit; the junction of Mill Lane North and Margate Road, close to the south side of the railway line - where a cyclist heading across the Thanet Way via the underpass has to turn right - is on a near-right-angle bend, with no sight-line to the left whatsoever. All this will worsen once the Altira development (basically a new Sainsbury supermarket) is open and there is more traffic. The good news is that the Altira site developer is building a new non-vehicular bridge over the railway line immediately to the east of the road bridge; work is continuing apace, and the planning application documents clearly state that this is for both pedestrians and cyclists. What is not such good news is the detail of what happens at either end of the footbridge where it rejoins the highways. The published plan fails to show any detail. On the north side, pedestrians have it easy as they will exit/enter the footbridge via a footway on Reculver Road. It’s not going to be so easy for cyclists, especially those turning right, as there are three roads to scan; not impossible. A crossing here would help. Where do cyclists go at the other end? At the other end however, for the cyclist heading to cross under the Thanet Way via Margate Road, (which would be by far the most likely destination, there being nowhere else to cycle to in that area, unless it be the two restaurants or the supermarket) the route from the footbridge debouches onto Mill Lane at precisely the worst spot - that 90˚ bend in the road which the cyclist has to cross to access the underpass. There is an alternative, if circuitous, route further along using Talmead Road, where turning right is a lot safer with fair sightlines in both directions. The route could then circle back on itself through the Talmead housing estate to Mill Lane and the underpass. It may well be that that is what the cyclist will feel safer doing. It remains to be seen exactly what Road Safety devices will be put in place in that area. I would hope to see a 10 or 15mph (absolute maximum 20mph) limit on that bend as that is the only safe speed for those highway conditions; prominent signage warning drivers of cyclists and pedestrians sharing the road; more street lighting! ; signage directing southbound cyclists towards Talmead Road; zebra, pelican or toucan crossings at strategic points.